Nickhil is a great guy to listen to. He is an advisor and friend to startups in the US and India. I personally find Nickhil’s experiences insightful and it is always a pleasure talking to him. He has done talks like these in Berkeley, Stanford, Symbiosis and COEP in the past and people love it. Even though this is last minute, you should definitely try to attend the talk. Nickhil is currently the CEO and Co-founder of mobile video search and delivery startup Vuclip. For details, see TechCrunch Mobile’s interview with Nickhil. Earlier, Nickhil was the President and COO of Praesagus, a MIT incubated start-up that he helped grow to becoming the most widely used design-to-manufacturing modeling software in its class, before its acquisition by Cadence Design Systems. 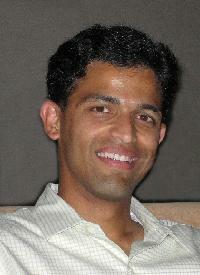 Post-acquisition, Nickhil became Engineering Group Director at Cadence where he ran the entire Manufacturing Modeling Group. Nickhil helped found and served on the board of directors of CommandCAD, an electrical CAD company that was acquired two years after its founding. Nickhil co-founded Timbre Technologies, a semiconductor manufacturing start-up, that won the first-ever Berkeley Business Plan competition, leading to a successful venture-backed financing. Nickhil served as CTO and VP of Marketing and Products as the company grew to become the industry standard in the field of scatterometry, before being acquired by Tokyo Electron Ltd. Nickhil remained at TEL for 3 years as Sr. Director of Technology and Marketing. Nickhil has an M.S. and Ph.D. from UC Berkeley and has been the recipient of many awards from various organizations, including the IEEE Best Paper Award in the area of Transactions in Semiconductor Manufacturing for 2001, the Berkeley Distinguished Pioneer Award, the NSF and MICRO fellowships. Nickhil is a student of COEP, and had won the Most Outstanding Student award when he graduated. Nickhil has been featured in several articles published in the United States and in India. Nickhil has to his credit more than 30 patents and 20 conference papers. Vuclip was earlier known as blueapple.mobi – and that was a bad business decision, and they ended up having to change their name to vuclip.com. Can you guess why? Vuclip went from a few thousand users to over a million users in just a few months, without any advertising. How? Where: 7th follor, Symbiosis Institute of Computer Studies and Research, Atur Chambers, Model Colony, Pune. Map.